Extended chronic phases of life-limiting illness and increasing multimorbidity present growing challenges that require a new approach to healthcare. A population-based approach is needed to harmonize policies, systems and services relating to chronic and palliative care. Partnerships are needed between different healthcare disciplines and specialties, and between health services and communities. Technology is likely to play an increasingly important role in transfer of information (including advance care plans) and enabling coordination of care. During periods of stability, patients and families should be actively involved in keeping well and helped to “hope for the best while preparing for the worst” to support sustained coping. A rapid response is needed to clinical events that helps people return to stability and takes preventive action against future events wherever possible. Transitions between chronic and terminal phases of illness and different settings (community, residential and hospital) need focal support to prevent people “falling through the gaps.” The optimal timing of referral to specialist palliative care services is the subject of ongoing debate and research. Consumer advocacy may play an important role in raising awareness and advocating for appropriate resourcing and changes to policy and legislation. Luckett T, Phillips J, Virdun C, Agar M, Green A, Davidson PM. 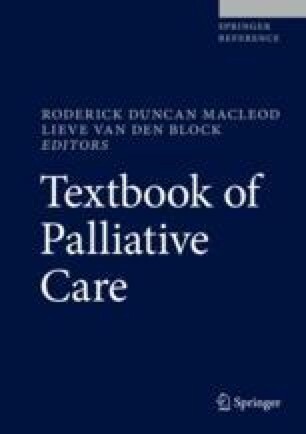 Elements of effective palliative care models: a rapid review. BMC Health Serv Res. 2014a;14(136). https://doi.org/10.1186/472-6963-14-136.